Many of us don’t spend a lot of time thinking about how people perceive seemingly little things differently, and how that reality might influence something like produce sales. This idea, the power of perception, recently surfaced in a big way with the emergence of a topic that came to be known as simply “The Dress.” The Internet exploded into a polarizing, yet good natured worldwide debate as friends and family alike argued whether the image of a certain dress circulating the Web was gold and white, or whether it was black and blue. Okay, now let’s shift gears to consider the issue of perception as it pertains to produce merchandising. 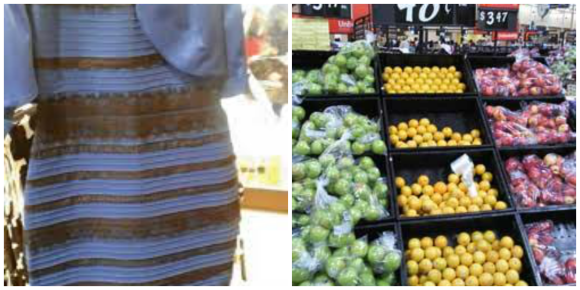 While there may be no throng of international celebrities tweeting their opinions like they did for the dress, customer perception is none the less an extremely important consideration in the produce shopping experience. As it happens, IFCO recently released a study comparing consumer perception between reusable plastic containers (RPCs) and corrugated containers. At first blush, both approaches to produce packaging might seem like two subtly different versions of the same thing, but the findings by IFCO suggest that people perceive one dramatically differently than the other. Let’s take a closer look. In order to uncover this information, IFCO conducted a number of shopper interviews, employing an online survey of US adults (18+ years of age) who identified themselves as the primary grocery shoppers in their households. They were shown images comparing comparable produce displays in corrugated boxes and RPCs, and asked questions related to preference for shopping as well as perceptions with respect to quality, freshness and value. The sample was taken primarily from seven major metropolitan markets, including Atlanta, GA, Dallas, TX, Indianapolis, IN, Los Angeles, CA, Phoenix, AZ, Portland, OR and Washington DC. The survey totalled 201 responses, providing a margin of error of 7 percent at the desired 95 percent confidence level. No dress controversy here. Respondents overwhelmingly agreed in their preference for produce displayed in RPCs versus produce displayed in corrugated boxes. Some 76 percent of respondents said that RPC displays are more attractive, while 60 percent believe that produce displayed in RPCs appears fresher (another 25 percent have no preference). In a similar vein, 61 percent believe produce displayed in RPCs appears to be of higher quality (27 percent with no difference) and 51 percent saying they would pay more for produce displayed in RPCs (39 percent with no difference). Overall, 68 percent said they would prefer to shop RPC displays, with 18 percent having no preference. The study noted that when respondents who preferred RPC displays were asked why they preferred them, they frequently mentioned the display container specifically as the reason for their preference. Variations of clean, organized, neat and fresh, were the most frequent terms used to describe the RPC produce displays. On the other hand, those respondents who preferred corrugated displays rarely identified the boxes themselves in relation to their preference. One interesting sidebar to the story is that some respondents who preferred corrugated boxes mistakenly believed that fresh produce had been restocked into the RPCs at retail, and therefore had undergone additional handling. With this in mind, IFCO recommends retailers telling shoppers that IFCO RPCs are shipped directly from the farm. There is, the company says, an opportunity to combine the positive perception of produce displayed in RPCs as being neatly organized and of high quality, with the message that the produce has arrived directly from the farm in the same container, without additional handling. The better that customers understand how RPCs work, IFCO states, the better they will understand that when they see RPCs on the floor, they are shopping the highest quality produce. Every produce veteran knows that appearance and presentation are critical, and in the final analysis, an understanding of customer perception can be an important part of that conversation. Getting a handle on customer perception and effectively leveraging it is a critical part of produce merchandising success. To read the IFCO study, click here.